Silver Eagle Bus, Golden Eagle Bus, GM, General Motors, MCI, Dina, Grayhound, Greyhound, Prevost,Gillig, Brill, Crown, AMG, AM General, Flxible, Flexible, and others . . .
Consignment Sales of: Buses (Highway, Intercity, Charter, Transit), Motor Home Bus Conversions, Motor Coaches, Private Coaches, & Entertainer Coaches For Sale! Yes the 400 has been modified, BUT the Ash Rate is over the limit of Detroit Diesel® specifications (1.41% to 1.50%) and As of this date does not give the staying qualities of the Delo® 100!!! Instructions where to find Locations with MAP & PHONE links. 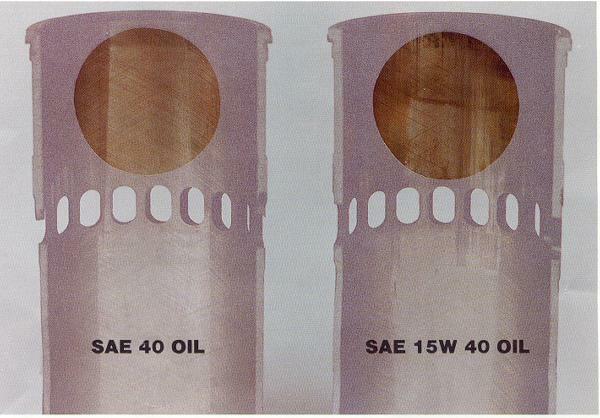 The reduction of friction and wear by maintaining an oil film between moving parts is the primary requisite of a lubricant. Film thickness and its ability to prevent metal-to-metal contact of moving parts is related to oil viscosity. The optimums for Detroit Diesel® two-cycle engines are SAE 40 grade oils. 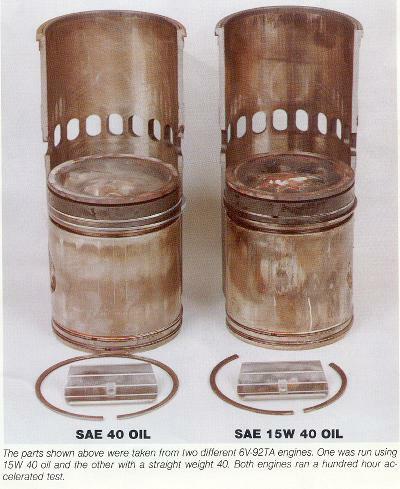 Temperature is the most important factor in determining the rate at which deterioration or oxidation of the lubricating oil will occur. The oil should have adequate thermal stability at elevated temperatures, thereby precluding formation of harmful carbonaceous and/or ash deposits. The piston and compression rings must ride on a film of oil to minimize wear and prevent cylinder seizure. 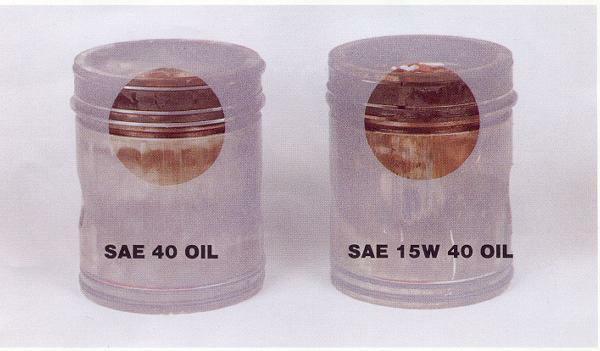 At normal rates of consumption, oil reaches a temperature zone at the upper part of the piston where rapid oxidation and carbonization can occur. In addition, as oil circulates through the engine, it is continuously contaminated by soot, acids, and water originating from combustion. Until they are exhausted, detergent and dispersant additives aid in keeping sludge and varnish from depositing on engine parts. But such additives in excessive quantities can result in detrimental ash deposits. If abnormal ash deposits form on the exhaust valve seats, early engine failure may result. Oil that is carried up the cylinder liner wall is normally consumed during engine operation. The oil and additives leave carbonaceous and/or ash deposits when subjected to the elevated temperatures of the combustion chamber. The amount of deposits is influenced by the composition, additive content, engine temperature, and oil consumption rate. Oil quality is the responsibility of the oil supplier. (The term "oil supplier" is applicable to refiners, blenders, and re branders of petroleum products). Oil quality can also be affected by handling cleanliness, contamination, dirt, water, etc. High ash oils (greater than 1,000 mass % ASTM D-874) tend to form excessive deposits on engine parts, resulting in impairment of their function (exhaust valve closure, for example). These are NOT recommended, except where the continuous use of high sulfur content diesel fuels (greater than 0.5 mass %) is unavoidable and where a high TBN, LOW ASH oil is not available. Less than optimum engine life must be expected when using 15w-40 oils. Multi-vis oils tend to break down due to mechanical and thermal stress which results in a loss of viscosity and premature engine wear. Multi-vis oils do help cranking when temperatures are below 32 degrees F (0 degrees C). However, once the engine starts, the major advantage of the multi-vis oils is exhausted. When the engine reaches operating temperature, the internal engine temperatures and pressures vary little from an engine operating in much warmer climates. This is when the 2 cycle engine benefits from the superior protection of a 40 wt. Starting aids such as automatic ether systems and /or on-board auxiliary heaters provide more reliable starting without sacrificing engine life. Shown are several component comparisons taken after a lube oil performance test. Straight 40 WT. Oils Information is now posted in at TEJAS OIL. There are hundreds of commercial crankcase oils marketed today. Obviously, engine manufacturers or users cannot completely evaluate the numerous commercial oils. The selection of a suitable lubricant in consultation with a reliable oil supplier and observance of his oil drain recommendations (based on used oil samples analysis and experience), and provide filter maintenance, will provide the best assurance of satisfactory oil performance. It should be noted that lube oil manufactures may reformulate and oil while maintaining the American Petroleum Institute classification, or may reformulate to a new API classification and continue the brand name designation. For example, SE oils being reformulated to SF letter code classification may perform differently after this reformulation. A close working relationship with the lube oil manufacturer should be maintained so that any reformulation can be reviewed and a decision made as to its effect on continued satisfactory performance. The Detroit Diesel® lube oil analysis program is recommended for monitoring the condition of the crankcase oil in all engines. Primarily, used lube oil analyses indicate the condition of the oil but not necessarily the condition of the engine. Never tear down an engine based solely on the analysis results obtained from a single used oil sample. However, the condition of the engine should be investigated using conventional mechanical and/or electronic diagnostic instruments. Frequently, visual inspections are all that is required to detect problem areas related to engine wear. It is also prudent to obtain another oil sample from the suspected distressed unit for analysis. Abnormal concentrations of some contaminants such as diesel fuel, coolant, road salt, or airborne dirt cannot be tolerated for prolonged periods. Their presence will be reflected in accelerated engine wear, which can result in less than optimum engine life. The oil should be changed immediately if any contamination is present in concentrations exceeding the warning limits.